Elegant Stripes design with side mirror pockets. Material - 190T Polyester taffeta, super soft, Water resistant fabric. Autofurnish Stylish Stripes Car Body Cover new stylish and elegant stripe design gives a whole new looks to your car. Cover includes side mirror pockets which are made precisely to the size of the mirror. 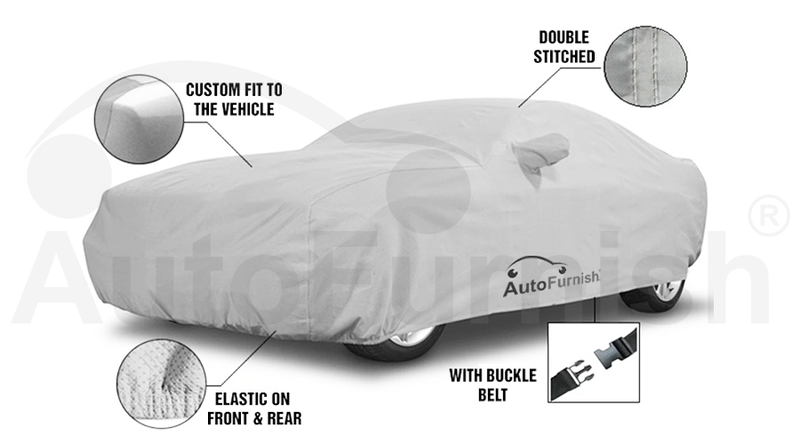 This car cover is made of 190T Polyester taffeta material which protects your vehicle against wet, humid and dusty climatic conditions. Double Stitched High Quality imported threads used to stitch the cover tight and securely. Highly durable and long lasting water resistant material protects your vehicle against natural pollutants, animal droppings, tree sap, industrial pollutants, and airborne dust and dirt. The inside material of the cover is very soft and is designed specifically to avoid any damages to the vehicle's paint during the course of removal or putting up the car The cover is Machine washable , Easy for handling and storing.